My sister Akki and niece Deeksha came to Bangalore on Friday, the May 17th. That day, we watched Iron Man 3 in IMAX. The IMAX experience was brilliant. Deeksha is an awesome entertainer. With her around time just flies. She imitates people, speaks dramatically for fun. Next day, I had my first French class for B2 level. While I went to class, they visited a friend. My teacher for this level is a French native which is a very good thing for us to catch the accent and pronunciation. Later that day, we watched a Kannada play at Rangashankara. It was a children's play based on a short story by Kuvempu (Narigalige yake Kodugalu illa). The play was very creative and the kids had brilliantly enacted the roles of different animals. On Sunday, While Preethi took my sis and niece to Maya hotel for lunch, I ran to my class. Evening, we went to Food street. We tried idli, dosa, Butter Kodballe, Chats and everything that was there. Light drizzle made the evening cooler and enjoyable. 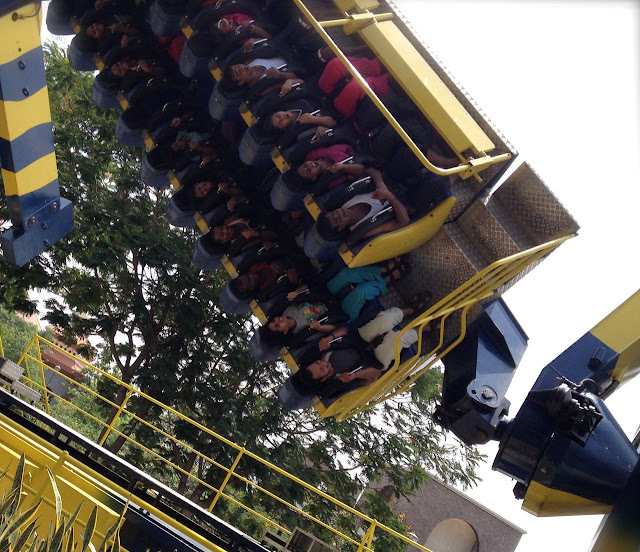 On Monday, Akki, Deeksha and I went to Wonderla. I was going to a amusement park after 6 years and thus it was very refreshing. A ride called insanity was the most feared but the most awesome of all, that made us turn in all possible axis. After a morning of dry rides, we bathed ourselves in water rides during the afternoon. Despite a weekday, it was terribly crowded due to holiday season. Every ride had long waiting but it was always worth it. I was visiting the palace for the third time and seriously I do not think it is a beautiful place as it is nothing like the one in Mysore. However for a change, there was a TV serial being shot there which made the place look little lively than otherwise. We watched a show at the planetarium called "Dawn of the space age" which captured the historic moments in space exploration. Starving to death, we had to rush to UB City. We lunched at Tuscanno, an italian restaurant. Pasta and Lasagna was very tasty. The desserts - Crème brûlée and Cheese cake was yummy. Four days just passed by with lot of fun and family time. After returning from a very exciting but also exhaustive trip, I had only one hour to get ready and meet my friends from office - Shankh and Prince. I had promised to meet them for a photography assignment we had been planning for a while. 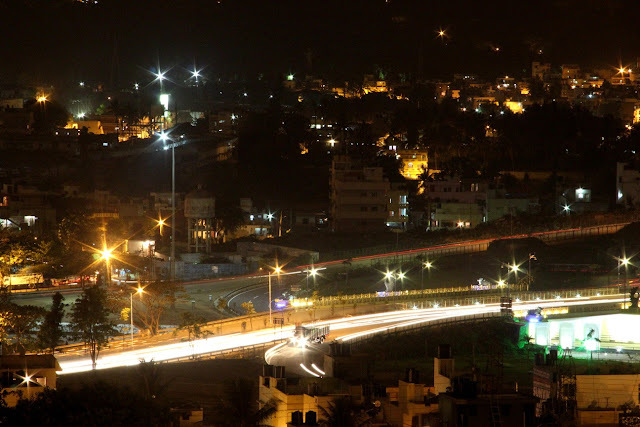 That is, to find a way to get to the hidden hill that we see daily from the outer ring road, reach there and capture the traffic during night. In that one hour that I had, the two most important things I could think of were to drink two glasses of delicious mango juice made and refrigerated by my mother before she left and to take a quick shower (Precisely in that order). I reached Shankh's place at around 6:15 Pm and we decided to walk. We met Prince on the way. Exploring the area and trying to find a way up the hill, we made our way into very narrow and clumsy streets of Girinagar that finally led us to a dead end. 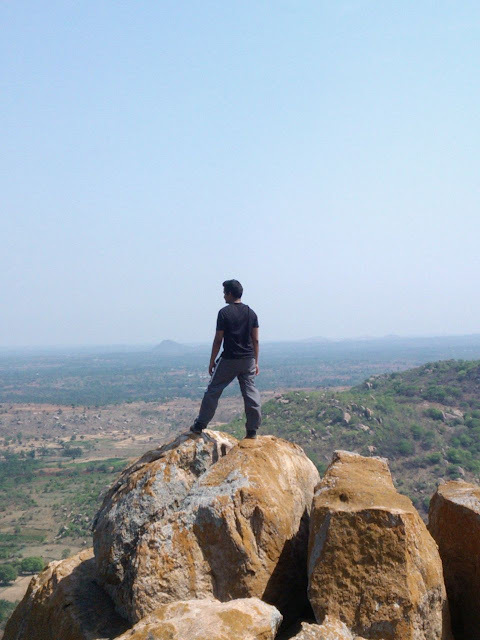 We did not even know how to describe where we had to go - A rock, on top of hill, that is viewed from the Outer ring road. But people around helped us identify it as Veerabadhra temple. After some more walking, we reached the temple. The location is very serene. 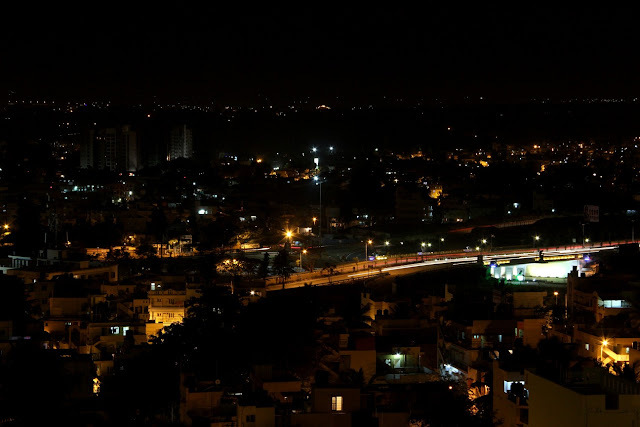 A huge rock, a small temple, a sitting area that overlooks the outer ring road below. Its a perfect place to sit in solitude. After few pictures that captured the traffic, I was done. I handed my tripod to Shankh and relaxed. The weather was very peaceful; Cloudy, windy, cool and prompting a probable heavy rain. I hated the truck for spoiling the look. But i now think differently. It acts like a reference to all other vehicles that are moving. After a while of photography we decided to get back. We walked back to Shankh's place for dinner. We just made in time to escape the rain. The evening was well spent. I enjoyed every moment of it and its always fun to be with people with similar enthusiasm and likings. When I returned home close to 11:00 PM, all I wanted was a good sleep to peacefully end this incredible day. 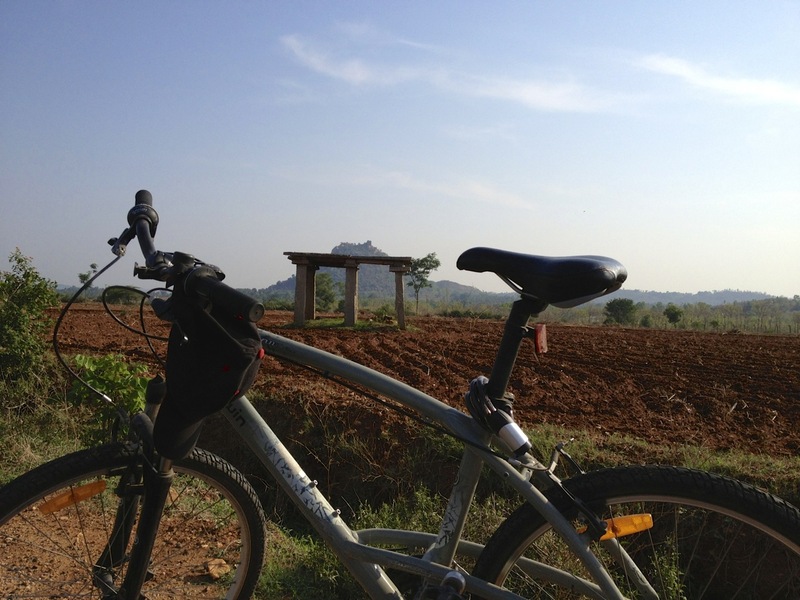 Bilikal Betta - Pedal & Trek! Interesting, I am writing this post as I realize that my cycle has been stolen. So this post is sadly special, as it would be recording my last journey on my first bicycle. On 11th May, I left home on my Btwin Triban trail bicycle at around 5AM. I hit Kanakpura road and met Achyutha on the way. We rode all the way till Harohalli. It was an interesting ride. I had a stream of consciousness run through my mind and form an article on Kindred spirits. Just before Harohalli, we stopped at a small darshini which is at a basement of a building on the left. At Harohalli we took a left turn towards Maralwadi, after checking for directions from the localites. There are actually two parallel roads next to one another, take the second. 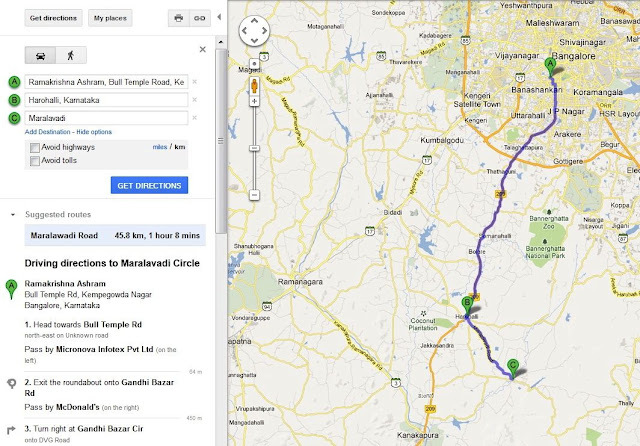 The ride from Harohalli to Maralwadi was brilliant. Roads were free of traffic, view was brilliant and luckily the sun was hiding behind the clouds. Trees full of may flowers shaded the roads. 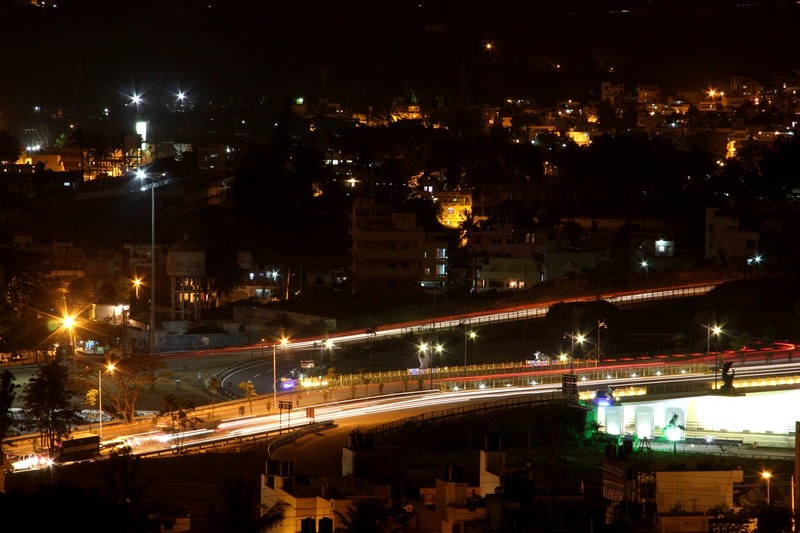 At Maralwadi junction one needs to take a right turn to a road that seems to get lost in a busy and congested market area. Follow this road until you reach the next village, where you take a left turn. In case of doubt please ask the villagers who are more than willing to help. 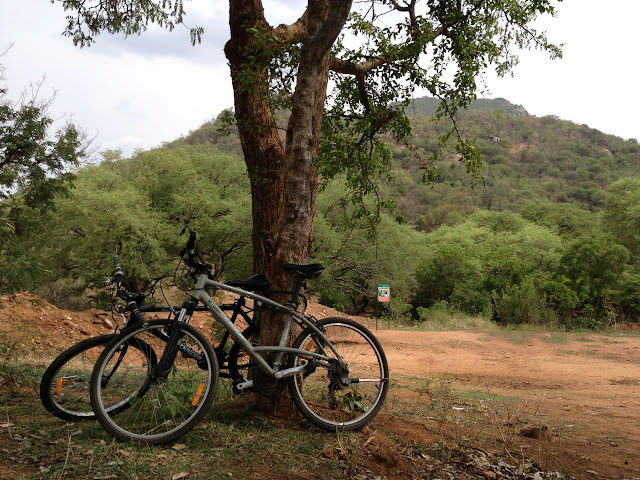 All through our way we received surprised looks from villagers who wanted to know to where we were going and we always left behind a debate as to whether we could make it to the top on our bicycles. We heard it all - "No Way", "Yes they can make it", "keep going, you can!" At the last village, people directed us to the base of the hill. A mud road ends at a temple at the foothills of Bilikal betta. We chained our bicycles to a tree and decided to trek. It was already 9:30 AM. There was an innova and an Alto already parked indicating human presence in an otherwise haunted looking hill. 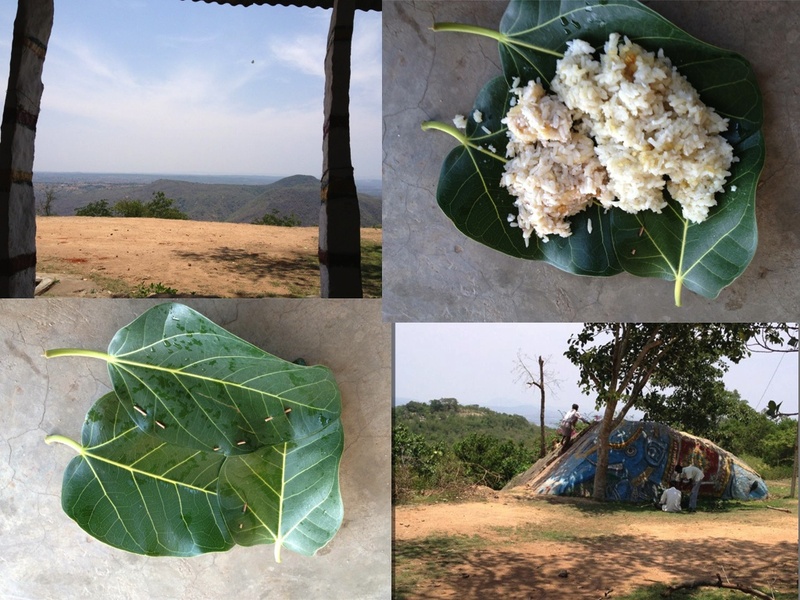 While we were about to climb some of the village kids asked us if we had packed any food. When we said no, they warned us that it would take us at least 3 hours and we would starve. Looking at the hill, it appeared like we could climb in about 2 hours or even less. The kids disagreed but the ladies supported us and a quarrel began between them. So we just left them to figure that out and started the climb. With only one bottle of water in hand and lot of thirst, we began ascending the hill with no proper trail and no sight of the summit. A blog that we referred had vague description that said nothing about the route but only described a temple at the summit. So we slightly took a detour and went to few white rocks in the left of the trail. We thought that was the place. The view from there was brilliant. But this was not the destination so we got back on trail. We were skeptical about the route. However, we thought of exploring the hill after having come thus far. Lack of water made it even more difficult. Almost towards the summit, we met the group who had parked their cars at the base; Three men, two boys and three dogs. 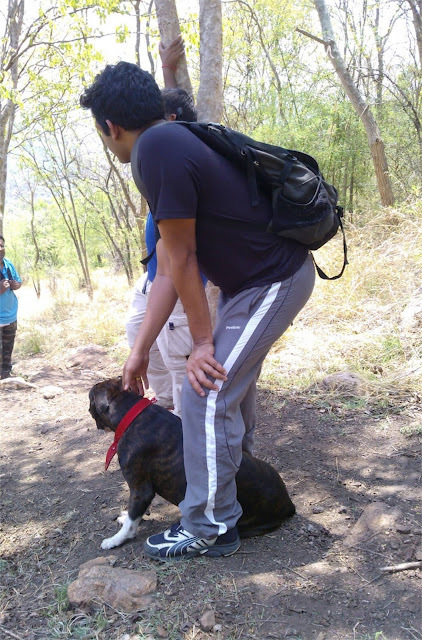 I was more than excited to see a boxer (Max), A mixed breed (Bruno) and a stray dog (Maya). With a brown-black body and white forehead, Max was my favourite. They gave us some much needed water. After a short conversation and the confirmation of route, we continued our journey. At the summit, the view was brilliant. 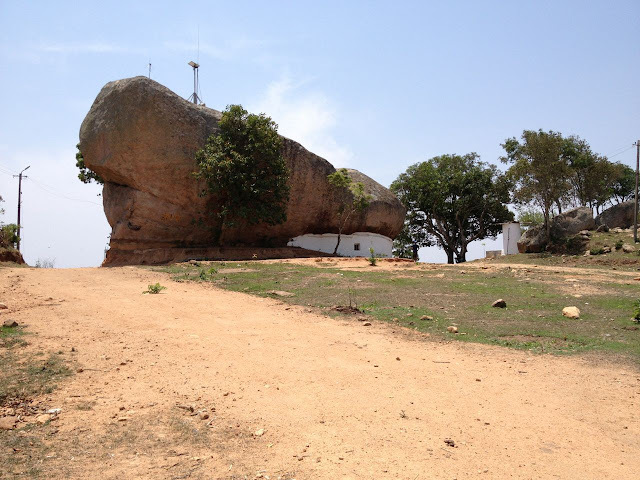 A huge rock, with a temple built around it, a kalyani (pond ) and rock painting of an elephant. Meanwhile, we drank a lot of water from a tank and filled the bottle for the return journey. We went to the temple whose main deity is Lord Ranganatha (Vishnu). Villagers were happy to see the flower from the idol fall as the priest worshipped. This is regarded as a good sign and direct blessing from the God to whatever your request might be. The villagers specially requested for the flower that had fallen during the pooja and felt as content as if the wishes had already come true. Its only the saturdays that are special. The priest stayed all day at the temple and the Villagers gathered for the prayers. We relaxed in the veranda for a while. When the priest was done preparing the food, leaves for eating the food were missing. So the villagers quickly plucked leaves of a banyan tree and used sticks from a coconut leaf to hold them together. Thus our plates were ready. Along with them we had our lunch, which seemed like one of the best lunch we had ever had. A simple mixture of rice, jaggery and coconut and a mixture of flatten rice, banana and jaggery was nothing less than a feast for us, at the moment. After thanking the priest for his hospitality and for providing us the much needed food, we began our journey back. I felt very happy about this hike. I remember thinking that without human interaction with nature this world would have been so boring. Its not just the nature that impresses me during my travels, but also the natives, their kindness towards fellow humans and animals, their adaptability to nature. Returning was easy and took us less than an hour and a half. On our way back we did stop to check the elephants that were making their way up the hill. But we could not spot them. The villagers told that they had just walked into a densely vegetated area. Elephant dung was all over the hill making it not a very safe area to be. At the base we found our cycles intact and we rode back. Hot afternoon sun made it exhaustive but thankfully most of the route back to Maralwadi was a descent and that made it easy. At Maralwadi, we boarded a private bus. 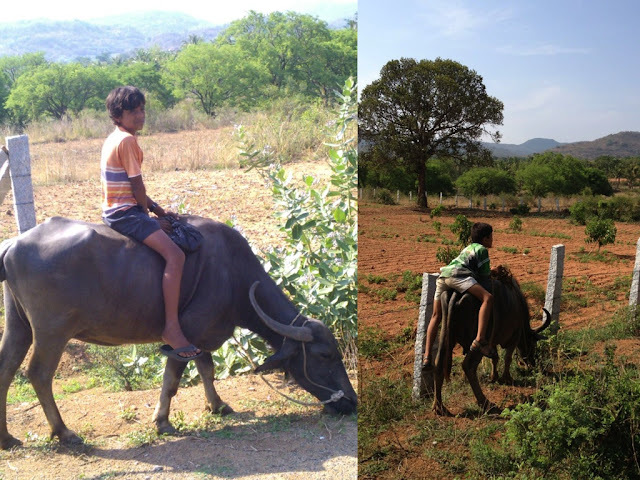 The cycles were loaded on to the bus top and we traveled back to Bangalore along with the villagers who were carrying their harvest to the market. It is interesting how the villagers bond with one another even though they dint know each other. I got down very close to home and bicycled back. The trip was amazing. 50+ kms of cycling, 2 hours of trek and a memorable experience at the temple. I could not have asked for a more eventful day. 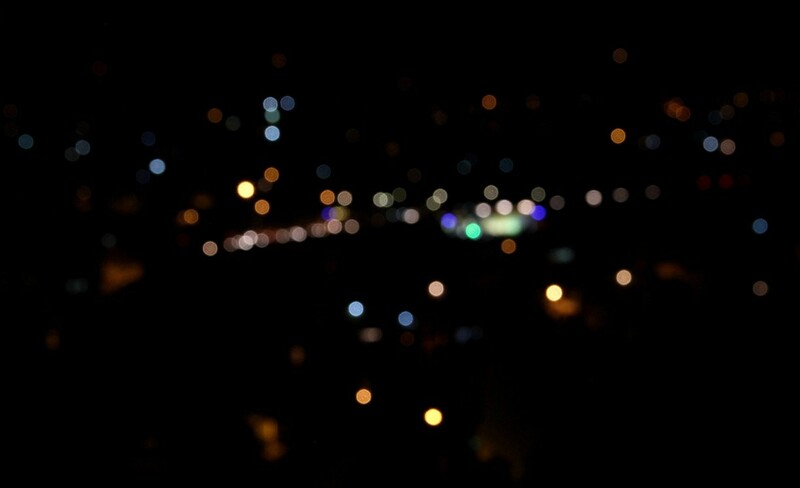 But the day did not end there, I had promised my friends for a photography assignment up a small hidden hill in the city. But little did I know then, that this would be my last long journey with my first bicycle! During the month of April and May, I watched several interesting films. I must say that most of the films I watched were exceptional. I might want to do a separate review on them someday. Exam, Red lights and Buried were few interesting thrillers with an unpredictable plot. But my favourite is Steven Soderberg's film - Side effects. Brilliant film for various reasons. Surprisingly some bollywood movies too were radically different from the usual cliché. "Bombay Talkies" was a good mix of four short films from talented directors telling stories that are so unconventional to indian audience. I also got to watch Anurag Kashyap's never released first film - "Paanch" on my favourite subject - coming of age. Brillaint film! My nephew Varun was here in Bangalore to write his common entrance test for engineering. After his exams we watched Iron Man 3 together. I requested my friend Parag to create a music for my film. He liked the idea and we had a short session on one of the sunday evenings. I loved the music he came up with. While he is working on improvising it, I am trying to use the recording to experiment. Sounds exciting!